It is called Surat at-Tawba and is also called al-Fâdiha (the Disgracer) because it disclosed the secrets of the hypocrites. Written copies of the Qur’an and reciters omit the basmala at the beginning of this sura, but there is disagreement about the reason for that. ‘Uthman ibn ‘Affan said that its meanings aresimilar to those of Surat al-Anfal and they were called “the two consorts” in the time of the Messenger of Allah. That is why they are put together and included in the “Seven Long Ones”. 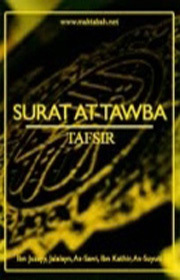 The Companions disagreed about whether they consisted of two suras or one sura. That is why the basmala between them is omitted. ‘Ali ibn Abi Talib said that the basmala conveys security while this sura was sent down with the sword. That is why it does not begin with security.